Q. That's the highest-ranked player you've beaten since the French Open last year. How proud are you of the win? RAFAEL NADAL: Well, is an important victory obviously because that put me in a good position to try to be in the semifinals, and at the same time I have a big day against a great player in a tough surface. I just happy the way that I play today, happy the way I working, as I say the other day. Just another step for me be able to play at that level against such a great player is good news. Happy for that. Just want to try to keep working the same way to keep confirming that I am in the completely right direction. Q. You've talked in recent weeks about the rest of this year being about getting yourself in perfect shape for next year. What does a victory like this mean for you going into next year? 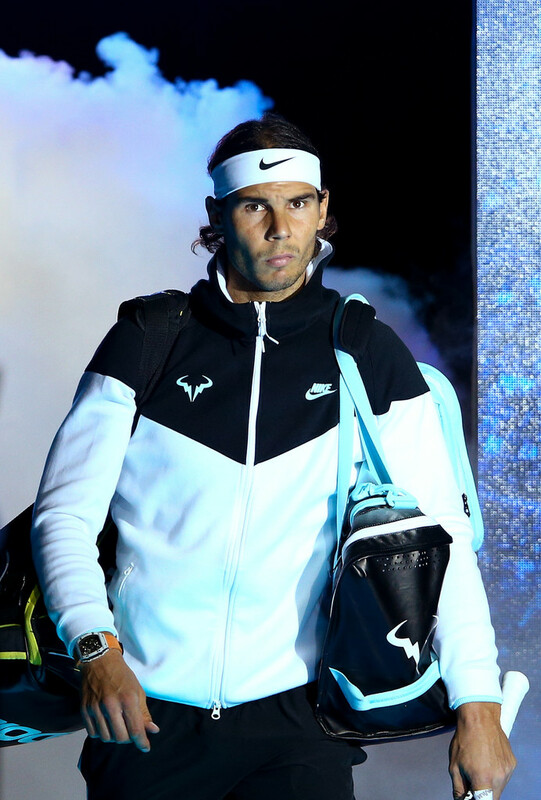 RAFAEL NADAL: The victories are important because at the end of the day that's confidence on the things that you are doing off court, no, outside of the competition. I know I am in the right way, as I said, since Montréal. I am playing much better, practicing very well, practicing a lot. Then you need results to confirm that. But I am quite confident when I feel that I am finding that direction, that way, on my practices, that sooner or later the positive results can arrive. So I believe that the last four tournaments, the positive results, the good feelings on court in terms of enjoying myself, in terms of image, is much better. That's important for me because I know I worked to find the level that I am today. But is just the beginning. I need to keep working so hard to try to keep going the same way. Not everything going to be like this. As I said the other day, when you come back from a period like I had, is like this, is like this. But the line is very positive, no? So happy for that. And obviously is an important victory for me and important day. Q. Are you surprised that it's indoors that you get your confidence back when it was not always your cup of tea? RAFAEL NADAL: No, indoor is a little bit more difficult, but not impossible. When I am playing well, I think I have been competitive in all the surfaces. But is true that always have been little bit tougher to play well on indoors than outdoors. At the same time I played lot of tournaments very bad in outdoors this year. So is good to finish the year with this positive energy. I hope remain at least hopefully two more matches here. I hope to finish the year with that positive feeling, that positive energy, keep competing well in terms of mentality, in terms of tennis, and then let's see. Q. When you feel that you are regaining your confidence, how does that translate on the court? Does it mean you feel like you can take more risks? Do you feel like you're moving quicker? Do you feel like you can use more areas of the court? RAFAEL NADAL: The sport in general is simple. It's quite simple. This is not a big deal about tennis or the sport in general. Normally it is not that complicated. But in that case for me, when I feel that I am able to have more times the control of the point, when I feel when I going to hit the ball I know the ball going to goes in, when I don't think about how to hit the ball, but when I think just about where to hit the ball, that's good news when all these things happens. This year, because things that we talked about enough, I was just worried about how to hit the ball to don't miss more than try to hit the ball where I need to hit the ball to damage the opponent or try to compete, just compete against the opponent. This year I have been more worried about myself than the opponents for a lot of matches. That's enough, no? That's impossible to compete at the highest level. Today I feel free. I feel enjoying on court. That don't mean I going to play well on every match. That means I am happy. I go day by day. Happy how the things are going the last couple of weeks. I think was late on the year, but at the same time is at least the right time I try to finish the year with that positive feeling. That helps to try to start next year in better shape. Q. I don't know if you saw what happened today in the first sets during a changeover, Andy Murray got some scissors out of his bag and cut his hair. I wondered if you have ever cut your hair, especially on a tennis court? RAFAEL NADAL: No idea about what happened. You asked him why? Q. He said the hair got into his eyes. RAFAEL NADAL: Was not at the right time to know that. He has practice before to try to know that (smiling). Was good. Is a good solution, yeah. Q. You defeated Wawrinka. Now you've beaten Murray. How far do you consider you are from the elite, Djokovic and Federer? RAFAEL NADAL: Andy is the No. 2 of the world today. The ranking in tennis is fair. The ranking in tennis is the result of long period of time, is one year. So if you are on the injuries, these kind of things, the ranking is not fair. But if you are able to compete the whole year, as I did, as Novak did, as Andy did, as Roger did, as Wawrinka did, then the ranking is fair. Djokovic deserve to No. 1, Andy deserve to No. 2, and Roger deserve No. 3, Wawrinka No. 4, and me No. 5. I don't know how far I have been. I have been winning the matches against the No. 2 and the No. 4 in straight sets. If we don't know that I lost a lot this year and I played bad for a lot of moments this year, and we arrive here, for example, with a normal year playing well, probably we will be here talking that I am playing great and I am at my normal level, competing against the best players. Knowing what happened during the whole year, I don't know how far I am. I won two great matches against two players, top-four players, in a tough surface for me. Today I here. Tomorrow I don't know where I going to be. Q. Your volleys were quite good today. You won 11 out of 13 net points. Do you try to get to the net more often? RAFAEL NADAL: I go to the net when I am confident. I go to the net when I am hitting the ball well, when I'm able to play aggressive. When that happens is because I am playing well. Not always, but a lot of times my volley works well when I am going to the net.